Sn spheres on carbon, images of identical area with different detectors – T1, T2, and T3. Image taken on Apreo SEM. Bringing a wide variety of new and exciting capabilities to our facility, a technology refresh of our Scanning Electron Microscope (SEM) capabilities was implemented in 2017 at CEMAS with the installation of two new FEI Apreo FEG SEMs. The new SEMs are capable of operating at voltages ranging from 30 kV, down to 200 V, and beam currents ranging from 1 pA, up to 400 nA. The microscopes are operable in both high-vac and low-vac mode, at pressures up to 500 Pa.
Electrostatic and electromagnetic focusing lenses, helping achieve sub-nanometer resolutions, even on ferromagnetic samples. Stage-biasing from -4000 V to +600 V, reducing electron landing energies, and enabling analysis of non-conducting samples. Everhart-Thornley detectors, retractable and segmented BSE detectors, as well as the trinity suite of in-column detectors, which drastically increase our imaging capabilities. Retractable STEM detector, allowing analysis of TEM specimens in the SEM. Retractable Cathodoluminescence Detector, for directly imaging red, blue, and green light generated by semiconducting samples. Easy and rapid analysis of multiple samples is now possible, thanks to a multi-sample stage in conjunction with a chamber mounted optical camera, allowing the user to load multiples samples and quickly navigate from one sample to the next. Four-quadrant imaging, capable of simultaneously collecting images from four different detectors, at resolutions up to 6144 x 4096 pixels. Images may be collected with active drift compensation, to produce high resolution images, even with charging specimens. New mapping software that is capable of automated image collection, stitching, and blending of images for high-resolution images montages that cover very large areas. Integrated pattern generation software with a gas-injection system, allowing for patterning and depositing platinum. Last, but certainly not least, both of these new microscopes are remotely operational in the virtual learning digital theater and beyond, allowing users at other locations to fully utilize these great, new instruments. Pegasus systems, allowing for EDS and EBSD data to be collected simultaneously, for advanced phase mapping. Octane Elect 302 mm silicon-drift detectors, capable of output count rates of 850,000 cps, and silicon nitride windows for optimal light element detection and quantification. 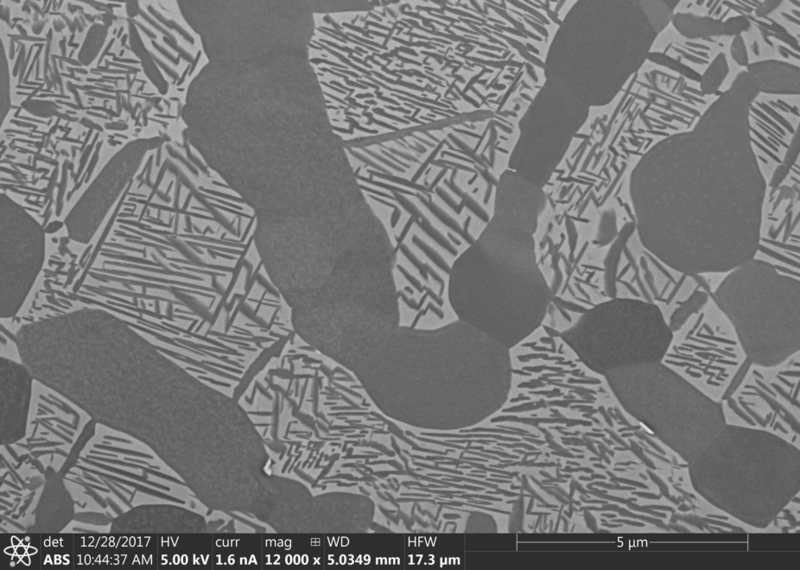 Hikari EBSD cameras, capable of acquiring up to 1400 fps, for ultra-rapid orientation mapping. These detectors are aided by the latest versions of TEAM and OIM analysis software, which have many exciting new features, including NPARTM and PRIASTM, allowing for even more rapid orientation mapping and characterization of materials. Click here to learn the difference between our two Apreo SEMs.